It describes his fictitious journey, filled with political criticism, through the nine circles of hell, beginning on Good Friday during the year 1300. Along the expedition, Dante encounters various sinning individuals, who describe each ring’s designated tribulations. “The Inferno” exists to support Dante’s political views of a rising Roman middle class and relinquishing power from the governmental aristocracy of that time. He begins the story in a dark forest where he tries to ascend a mountain, but wild beasts turn him away. Soon he encounters Virgil, an ancient poet, who becomes Dante’s guide. The two characters encounter increasingly wicked sinners who refuse to repent and attempt to rationalize their transgressions. Throughout the descent, Dante transforms from a man of great pity towards hell’s inhabitance into one of malice towards the intentionally disobedient. Dante’s Inferno is an incredibly thought provoking book. 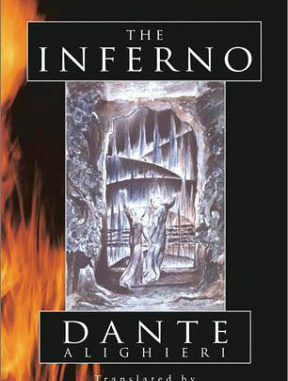 I enjoy Dante’s perspective and find the political aspects of the book humorous. Due to the focus and historical references, I would highly recommend it to mature readers with some historical expertise.